After falling behind on posting, I have been attempting to write two posts every time I write a post and to catch up to the present day. It’s clear that it’s never going to happen, though, so I need to revise my strategy. I don’t need the extraneous, self-generated pressure of feeling like I need to archive every significant workout I do in written words. So I’m going to jump straight ahead in time to my third triathlon, which took place on September 1st, and then just start posting in the present tense again. And if I feel like going back to recount an experience I can, but I’m not going to try to catch them all up. Just keep moving forward. 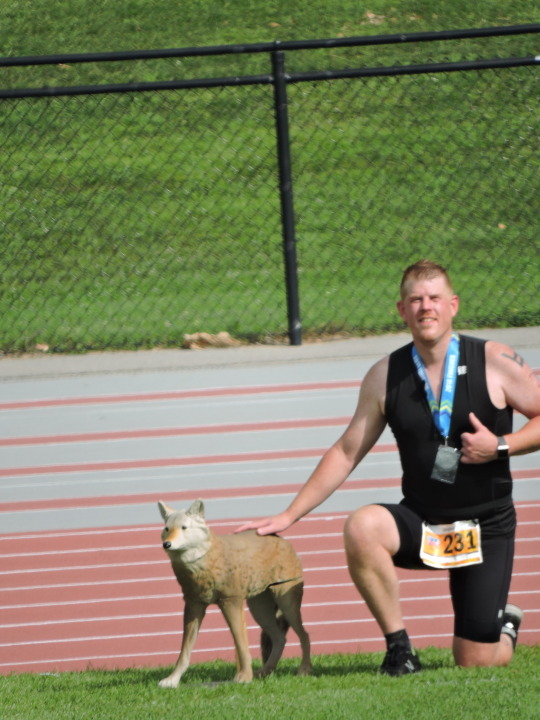 So, without further ado, here’s my race report for triathlon #3! 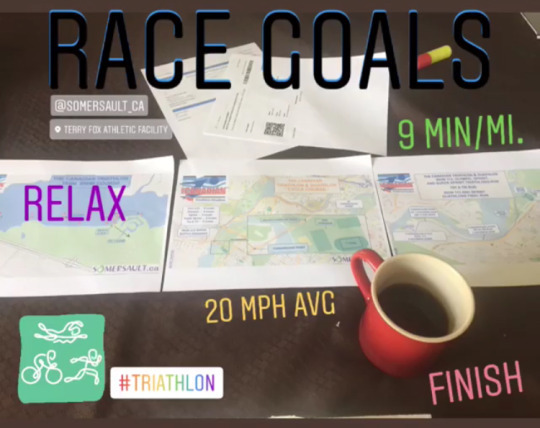 I sort of built my season targeting this as my ‘big race,’ even though it wasn’t all that different from the first two I did in all practical terms. I traveled to Ottawa to do this race (had friends to stay with) so it felt like a more exotic and exciting way to do a race. 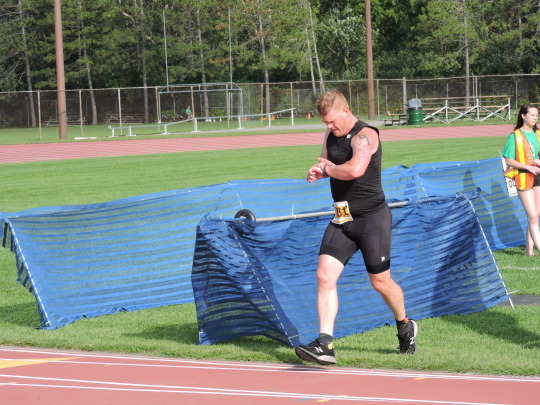 So it was a goal race for me in terms of being a culminating event of my season. I haven’t done many triathlons yet, so I wasn’t entirely sure if my judgment was off or not, but my first impression of the transition routes was that they were terrible. They seemed to be really far to go, particularly for a sprint, and through some ungainly terrain. I wasn’t looking forward to running up a sizable hill from the beach, barefoot, on an unswept asphalt bike path. I also wasn’t looking forward to running super far in bike cleats — including up and down some small hills, across a football field and along a dirt footpath into a gully (I bike in socks, so I couldn’t do the shoes-clipped-in-already method; might be something for me to work on in the off season) But maybe I had just been spoiled at my other events and this was normal. I didn’t really have the experience to know. And anyway, there was nothing to be done but make the best of it. The transition area was in the middle of an Olympic-sized running track, which was fenced all around. Athletes could only enter from one end, so I had to walk halfway around to get in. Security was tight on seeing numbers and matching bike tags. God help you if you forgot anything. I appreciated the care taken to ensure people’s bikes were protected but I think the entrance could have been closer to the other side of things. I ended up having to sprint from the transition area to the beach in order to make the race announcements. My fault for not arriving early enough I guess, but I didn’t realize how long it would take to get everywhere. The swim was pretty similar to the other two I had done, which is to say I don’t think there was anything too exceptional about it. It was in the Rideau Canal, which technically has a current, but I didn’t notice much. The water was a comfortable temperature, but quite weedy and murky. I was aiming to simply stay relaxed and find my own rhythm, and I was able to do that for the most part. Only got kicked a couple of times, which was an improvement over my other races so far. 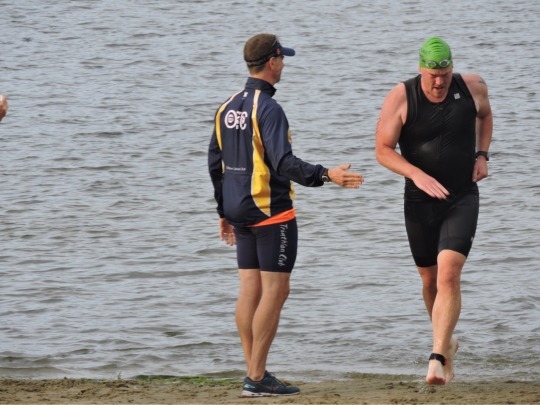 The guy who did the race announcements high-fived everyone as they got out of the water. I left the beach and ran for the track. As expected, it turned out to be an effort. I started on the asphalt but then started running on the grass, as my feet were hurting. I was a little nervous about what might be hiding in the grass to poke my bare feet (rocks? snakes? tiny Canadian leprechauns?) but I didn’t end up stepping on anything. I felt more winded by the time I got to my bike than I had when I exited the water. I got my stuff on without trouble and headed out with my bike. First out of the track area, then across a football field, down a forest path, down and up a gully, across a road and finally to the mount line. Cycling is my strongest discipline and the one I look forward to the most. I knew my biggest challenge here would be pacing. The course was virtually flat, which was a disadvantage for me because I’m a Clydesdale and I get a lot of benefit from the downhills. With no hills to speak of, it was entirely up to my legs without much of a gravity assist. I paid attention to my heart and breathing, trying to keep things steady and not going overboard, while aiming for my mph average. I thought it went pretty well. I wasn’t breathing very hard for most of the 3 loops, and only really started to feel it at the end of the 3rd. 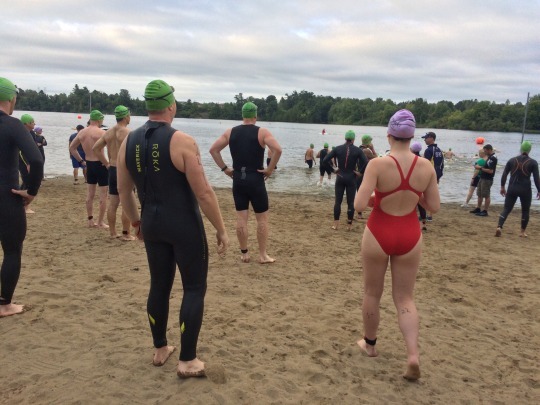 I also caught a bunch of people, some even from the first swim wave that went out 5 minutes before mine, so I felt I was doing ok. I had been nervous about losing count of my laps, but they had people announcing your name and what lap you were on, which was awesome. It was also cool to see all the different racers on the same course, because it was a looped route. 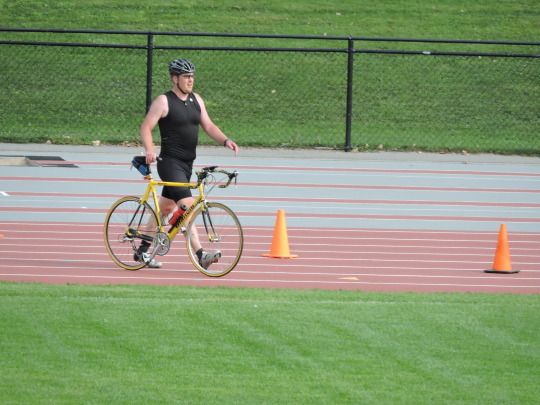 The iron distance folks were doing 9 laps to my 3. I nailed my average speed goal. Once I hit the dismount line, things got awful. Running after the bike is not comfortable, as we all know. For me, this was way worse because I had to traverse the same off-road route back to the track, in cleats, with jelly legs. I tried to run, but I mostly couldn’t and had to walk. My calves started seizing when I tried to run on elevation in my biking shoes, and having had a calf injury earlier in the season, I wasn’t willing to risk hurting myself. So I walked it in. My watch failed on the run – just wouldn’t work for me at all, so I had no idea of my current pace. That was frustrating. I felt pretty awful, which I have come to expect for the first mile or so. Usually it evens out and I find my stride, and things feel better after that. Not so today. I kept it going but I was riding the struggle bus the whole way. I felt underhydrated, especially in the sunny sections. The last mile was a mental battle. I ended up only about :15 off my goal pace, so it turned out it wasn’t as bad as it felt. I had passed a couple of other Clydesdales (I could tell from body marking) and none had passed me, and I didn’t see anyone my age pass me, so I had suspicions that I did relatively well in the rankings. When the results were posted, I saw that I had won the Clydesdale category! I checked to see where I would be in my age group, had I picked that option, and I would have been second! I was the 17th male, and 20th overall out of 115. They were by far my best results, so it turned out it felt hard for a good reason. I got a ‘gold champion’ lanyard to add to my finisher’s medal and other race swag. The race was organized pretty professionally and seemed to be run well; my only complaints were that the transitions were so challenging. It seemed like they were expecting more people – there were lots of empty racks and a ton of space on the field. Maybe a low year for them. I’m not doing any more triathlons this season, but I’m excited to continue training and to work toward Olympic distance next year. I don’t really have any idea how to make that leap, but I’m motivated to find out!